We hope to restore access to all services as soon as possible. At this stage we don't believe our database was compromised, however we recommend users stay vigilant to unauthorized access of their accounts. "fux0r With The Best , Die Like The Rest"
You sure like the code tag! I don't have a problem with links. As long as they're harmless. Mybb I don't know much about. Why all the fuss? Well, it's as old as SMF, and routinely beats SMF in 'best forum' discussions and polls etc. But imagine the announcement were about simplemachines.org. That's the scale of what they have to deal with. 1. Though I honestly have no idea why. The admin panel is confusing, I find it more so than SMF's! It doesn't install properly out of the box on localhost without help, and it's trying to pretend to be vBulletin 3.x. 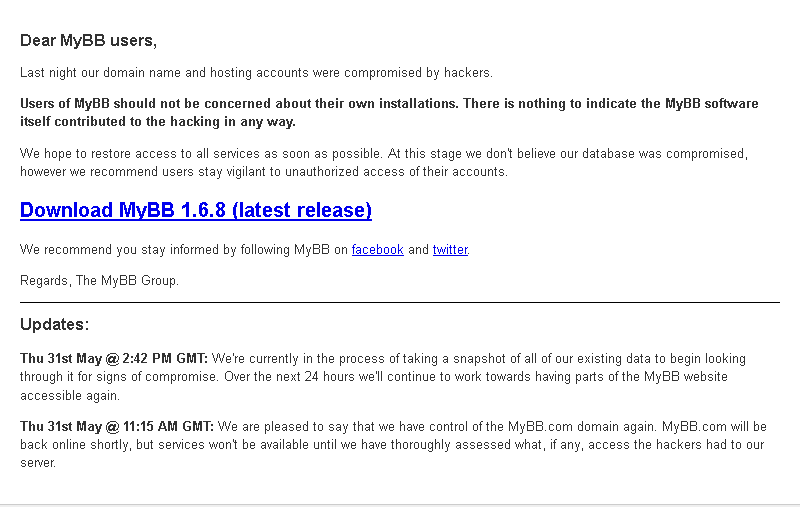 Oh, and the MyBB fans are even worse than Apple fanbois for hyping the software and ignoring competitors. There are many MyBB fans I've met who won't even sign up to an SMF forum because it's 'worse'. Until you reskin it and it doesn't look the same as SMF default themes, of course. Then they join because they don't realise it's SMF. There are many MyBB fans I've met who won't even sign up to an SMF forum because it's 'worse'. Until you reskin it and it doesn't look the same as SMF default themes, of course. Then they join because they don't realise it's SMF. Meh, MyBB is okay I guess. It feels like an outdated vB install for obvious reasons.